Bulldogs forward Liam Picken will miss the remainder of the 2018 season as he continues his recovery from concussion. 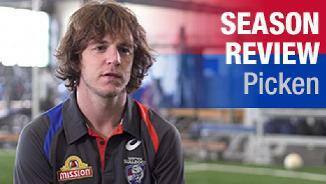 Liam Picken opens up on his battle with concussion. Veteran Liam Picken has returned to full training this week. Picken: "To be able to kick some goals was nice"
Tenacious and unselfish, Liam Picken continues to win admirers with his approach to football, becoming one of the most well respected taggers in the competition. Picken’s persistence has never been questioned, transitioning from a mature aged rookie in 2009 (selection 30 overall) to polling third in the Best and Fairest in 2012. Picken is one of the Club's most durable players, having not played less than 20 games in a season since debuting in 2009. After building a reputation is a tagger, Picken has taken his game to a new level under Luke Beveridge as an offensiveand ball-winning midfielder, averaging over 23 disposals per game. Picken played every game in season 2016, and was instrumental in the Club's stellar post season run to its first AFL Premiership in 61 years. Picken was subsequently named the Club's player of the finals series. The picture of consistency, Liam Picken has played 20 or more games in every season since his debut in 2009. In 2017, Picken led the club’s goal-kicking tally, finishing with 24 majors for the season. He kicked a career-best six goals in round 18 in Cairns to sink the Gold Coast Suns. He also kicked three goal hauls on three occasions (Round 23 vs. Hawthorn, Round 20 vs. Lions, Round 14 vs. North Melbourne). Picken signed a new two-year contract extension in April until the end of 2019. “The ability to play more in the forward line helped me throughout the year. To be able to do that and kick some goals was nice. - Liam Picken, September 2017. 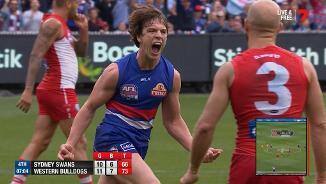 Dour stopper to goal kicking midfielder in two seasons – the Liam Picken story is well told, so it was fitting that he put the exclamation point on the Bulldogs season with the final goal of the grand final. Picken’s finals series was one of the great runs. While his per game averages weren’t that different from the home and away season, it was on the scoreboard where he had the most impact, kicking eight goals in four games, including three in the grand final. A tenacious two way player, Picken was fourth at the Club for score involvements, tackles and marks and second for contested possessions. Recently turned 30 but looks to be getting better. Picken’s 22 handballs against Geelong in round 19 was a career high. “I was just sort of chugging along with a couple of ups and downs there but I finished off strongly which was great and I couldn’t be happier how it ended. 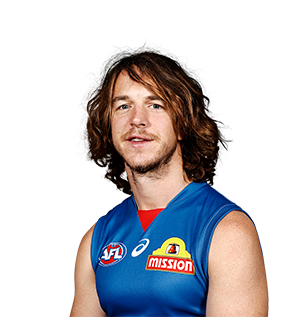 Perhaps the ultimate beneficiary of Luke Beveridge’s attacking game style, Liam Picken was given a new role in 2015. The former tagger developed into a more offensive midfielder, winning his own football and finishing the year with 497 disposals – his best output from seven seasons. Most impressively, Picken didn’t compromise his hard-edged defensive style, averaging four tackles – 10th in the league. One of the most consistent performers, Picken finished 10th in the Sutton Medal count. The 29-year-old’s best performance came in the gritty round five win, suited to Picken’s strengths. He gathered 33 disposals, four marks, 12 tackles and two Brownlow votes, guiding the Dogs to arguably their best win of the year. Picken notched up a career-high 36 disposals in round 15 against the Suns. Picken has established himself as one of the most feared taggers in the game. With a close-checking style, Picken built on those skills in 2014 shutting down some of the game’s best. Playing all 22 games in 2014 and overcoming Gold Coast’s Gary Ablett and North Melbourne’s Lindsay Thomas – Picken put in a consistent season. Most impressive was Picken’s ability to win his own ball, averaging 18 disposals for the year, including a pleasing performance in the Dogs 63-point loss to Sydney in round 22. Picken amassed 25 disposals, 10 marks and six tackles. Although stopping some of the game’s best in 2014, Picken managed to average 18 disposals, showing he has the ability to hurt sides on the attack. “He just plays it as hard and as tight as he possibly can and that’s not always the case with people playing that position. “He’s a very important part of our side. He’s a lot more versatile than people give him credit for.” – Bulldogs senior assistant coach Brett Montgomery on Picken in August 2014. The tough-nut midfield stopper put in some fine performances in the early part of the season. At his typical tenacious best, Picken frustrated opposition midfielders while gathering plenty of contested ball from aerial and ground contests. In addition to containing the likes of Cyril Rioli, Jeff Garlett and Tom Mitchell, Picken averaged 22 disposals of his own. His 27 touches, five inside-50s and a goal against Carlton in round 20 provided a memorable highlight. At the end of round 21 only two shut down players had kept their direct opponent (of 30 minutes +) to under 16 touches on average per 100 minutes – Picken and North Melbourne’s Taylor Hine. The Bulldogs hard nut’s feat was even more impressive as he accumulated over 15 possessions himself over the same time period. From 18 games he had 12 run with assignments, claiming the scalps of some of the competition’s most damaging players. Going from strength to strength, Picken executed his role in season 2012 with skill. Ranking third in the Charlie Sutton Medal he also took out the Brad Johnson Best Team Player Award, a special honour given that both players and coaches influence its appointment. One of Picken’s main strengths is his tackling pressure which sees him rank first at the Club for tackles (119) – with 32 tackles more than the 2nd placed Matthew Boyd. He also saw a career best in disposals (28) and equalled his personal record with 13 tackles on multiple occasions this season. The hard-at-it tagger had a standout season, playing all 22 games in a variety of defensive roles and finishing eighth in the best and fairest. Had a career-high 27 possessions and laid eight tackles against St Kilda in round 12. His uncompromising, fearless attack on the ball makes him one of the first players picked each week.